At long last, I’ve been able to combine the two great passions of my life: climbing and Morrowind! Frankly, I’m surprised it took me this long. Anywhoo, I do like mountaineering and climbing IRL, and I’ve always been super impressed at the fitness level of my Morrowind character. Like, it is difficult to even *walk* up one mountain in a day, and yet she jumps up multiple mountains almost every day. That is ridiculous. So I like to imagine that she would be super buff, woody, and fit from jumping up mountains all the time. Her jumping muscles would be especially well developed! I like to think that Turedus Talanian is amazed and perhaps somewhat envious of Steen’s amazing muscles, whilst Master Aryon is just completely unperturbed by the whole thing. Partly because I imagine it would take a lot to ruffle his feathers, but also partly because Aryon sees Steen all the time so it is old hat for him. I also thought it would be a good sub-joke if Steen got so huge that she couldn’t fit into her old pants anymore, so she would start walking around wearing… essentially a leotard I guess. But I’m not sure if that part of the joke really reads well here, hence why I decided to spell it out. 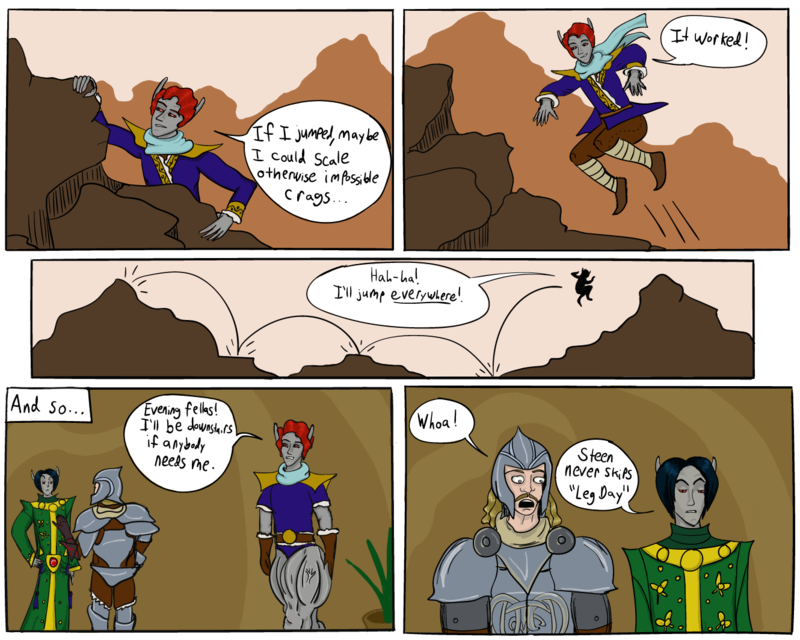 This entry was posted in Art, Gaming, Videogames and tagged Master Aryon, Morrowind, The Elder Scrolls. Bookmark the permalink.